The problem following the route is indeed still present. Just on a flight from ESSA to EDDH. The SID and the next two following waypoints went without problem. 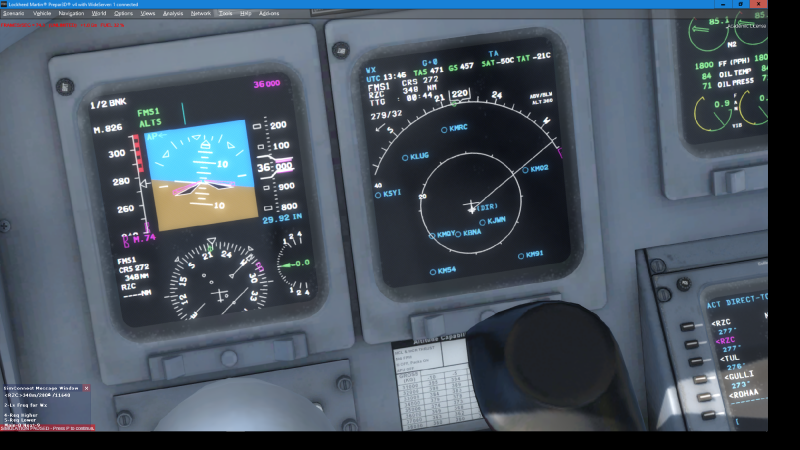 Then suddenly at the third waypoint the plane just turns left from the route and I have to use HDG to follow the route. The leg that fails is very long (ABAMA to BAGOS - 224nm) but still that should be possible without problems. Was flying the following route LNAV went southwest after BNA even though the route should have commanded a westerly track onto RZC. The CRJ900 followed the route flawlessly from KCLT through the BOBZY3 (accepting 2 DIRECT TO commands to get on track while climbing out of KCLT) to BNA. Following BNA is when the unexpected deviations occurred. i attempted to take a screen shot but had a CTD before I could take the shot. unfortunately the crash did not generate a report in the event viewer or APPCRASH. My V101 CRJ700900 install is fresh (removed previous version before I installed). Flew the same route with same LNAV results. 5 flights with the CRJ700. 5 times, I have the FMS set as DIR----> Menbo. FMS source is FMS1. On direct heading and on the white line. Select "Nav" switch and autopilot immediately commands a left turn. Plane just turns to the left through 270 degrees of turn Until I take over and, using heading hold or hand flying, manually send the aircraft toward Menbo. This aircraft is grounded until this is sorted out. Seeing the same thing here. There's a navigation anomaly with every flight. Even when LNAV follows the expected path it typically overshoots the heading by 15 to 20 degrees before tracking back to the commanded heading. I don't know that it should matter (would not expect it to matter) but I am using NAVIGRAPH for NAVDATA. Also seeing the same thing. It tries to follow the route but it's a mess. When it finally corrects it often is flying parallel to the flight path many nautical miles away. At first I thought it was only when the waypoints were a long distance away, but it happens on short legs as well. Following a STAR is impossible in nav mode. I wish I would have kept my 1.0.0.4 installer that's been the best version for me. I never even tried 1.0.0.5 because of all the bad things I've heard about it. I have this issue as well, with the latest variant. After KIRDI it goes right and forgets about the FPLN. Tried 2 times, every time did the same. FMS1 is used and displayed. NAV is selected. Also several times (other flights) I saw it flying parallel with the track. I am too suffering from the never-ending NAV problem. After 3 updates, I am so disappointed in Aerosoft, and beginning to think that this will never be solved. I am so sad because I truly love the CRJ and other than this dreaded Nav problem it seems to work fine. I don't know what the problem is here but I really hope you guys can get yourselves together, because I am seriously considering a refund. Frustrating yes but I think they will fix it. Give it some time. Just wanted to share I too experience a similar issue, when in NAV mode, and the distance between legs is "long" ("long" seems to refer to > 100 NM as far as I can tell at the moment). Upon arriving at a fix where the distance is "long", the a/c wants to turn right for some reason. I then intervene and use HDG mode until I'm closer to the fix and can then use NAV mode again without issue. Yeah I really hope all of this silence means they are working hard to fix the issue. Is it possible that older file versions of the program are not being removed? They would be overwritten even if they're not removed. This can't be the problem. Aerosoft has nothing to do with this. It's my project and I'm going to fix this problem. Bad news though: I'm on a business trip (since last Monday) and won't be home before Friday evening. I will try to look into it before but I'm very limited in what i can do on my laptop. It will be fixed once I know what it is. Until then, I have to ask for a little patience. Maybe go ask PMDG for some advice?? Cheap shot! PMDG forums don't seem to be fairing much better. I thought the purpose of these forums was to work WITH the developer, not against him. I have no idea if you meant well or you were being a jerk, but such a statement is infuriating. If you meant well, they I'd say your statement is merely born out of an woeful ignorance. No offense intended, just the way it is. By the way, your lack of knowledge regarding post release product development at PMDG is a little disturbing (at least for someone who would give such advice). You might have known on your own that while the guys at PMDG do excellent work, each of their products have gone though the same post release development at the CRJ is going through. Finally and incidentally, developers often speak with one another, it's a small club. Hans, understand completely and thanks for the info. Pls let me know if you need any additional info from me. yes take you time Hans, it's not the end of the world. Thank you for communicating with us and giving us updates. The enroute LNAV with long directs seems a lot more stable, but now the SIDs and STARs are a lot less precise. I know this was a temporary fix, but it would be nice to not have to sacrifice one for the other in the future. Tested v1.0.1.1 as well. LNAV is working much better but noticed the LEFT REV ARMED indication error is back. The enroute LNAV with long directs seems a lot more stable, but now the SIDs and STARs are a lot less precise. It doesn't contain ANY changes in this area... absolutely zero.